Vintage 1946 Laura Wheeler craft Sewing Pattern 733. 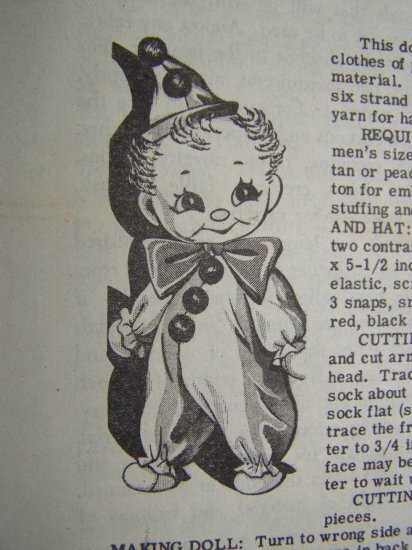 Make a cute stuffed clown doll and clothing using a white sock that is 11.5 - 12" long. More new, vintage and out of print sewing patterns listed. Measurements: Uses a 11.5 - 12" white sock. S & H to USA is Free first class folded and mailed in an envelope. I use priority flat rate envelopes for $5.00 shipping and can fit a lot of patterns inside. S & H to Canada is $2.00 folded and mailed in an envelope. Payments accepted: Money orders, Cashiers checks, Personal checks, Debit cards - credit cards - online checks - balance transfers through Paypal (no Paypal account required).